Speaking at this year’s World Economic Forum in Davos, John Cryan (the co-CEO of Deutsche Bank AG), said that cash could become history “within a decade”, going on to note that it is terribly inefficient. Mr. Cryan also focused on the way in which cash supports the underground economy. Cash should be dematerialised, he said in a panel on the future of finance – and governments should be interested in this process because it would make transitions more traceable and would help to combat illegal financing or money laundry. Yes, all good reasons for getting rid of it. Hence it seems to reasonable to ask, and were I to have been present in Davos I would certainly have asked, why it is that central banks keep pumping the stuff out? On Deutsche Bank’s home turf, for example, cash is already undermining the law-abiding majority. As even the most cursory examination of the statistics shows, virtually none of this cash is used to support the needs of commerce (the Bundesbank estimated that only 10-15% was used for this) and the rest of it is unexplained , as they say. This tallies with the Bank of England’s estimates that perhaps a quarter of the cash in circulation in the United Kingdom is for what they call “transactional purposes”. So in two of the world’s largest economies, at most a quarter of the cash out there is actually used as a medium of exchange. And this fraction is, as you might imagine, steadily falling as cash is replaced at POS and, increasingly, in inter-personal transactions. I just paid Vic Keegan the money I owed him for the football on Saturday using my bank’s app and I can’t imagine how I might be persuaded to go to an ATM and draw out money to post to him instead. Nevertheless, as cash is falling out of favour as a means of exchange, the amount of the stuff “in circulation” continues to grow. Here are the Bank of England’s figures for the UK over the last forty years. So. Cash on the road to extinction? 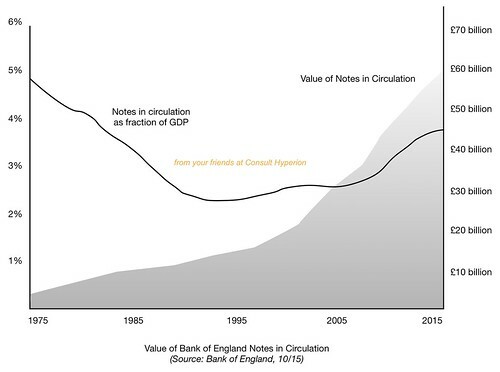 Well, as the chart above shows, there is now more cash than ever in circulation in the UK and the amount of cash as a fraction of GDP is trending up, not down. What on Earth is going on? More £50 notes than ever out there and I never see one from one year’s end to the next. Cash increasing as a proportion of GDP but falling as a share of retailer payments so, as we discussed here recently, who is using it and what for? Look, I think Mr. Cryan is right, although probably not in the way that he means it. I mean that we will be effectively cashless in the timescale he discusses. Cashless in the Count Zero sense: cash will still be around and it will still be legal tender (although I don’t think people understand what a limited concept this is), but cash will disappear from polite society and from the daily lives of most people. The middle classes will never see the stuff. Although, to be frank, they pretty much don’t see it now as we are a debit card society. Assuming there still is a European Union in a decade then there will still be Euro banknotes and there will still be Eurocoins coins. But they won’t matter for business or for the economy. If this is the cashlessness that the Deutsche Bank co-CEO is imagining, then I’d say he is spot on. It’s a cashlessness that is too conservative to reap the benefits of a truly cashless economy, too disorganised to reign in the criminal exploitation of cash and too wedded to the symbolism of physical money to switch it off (just as we switched off analogue TV not that long ago). Thus by “cashless”, I mean that cash has ceased to be relevant to monetary policy, become irrelevant to most individuals and vanished from most businesses. As we look to the future, we can begin to ask, quite reasonably, whether developments in digital payment technology and changes in payments and banking regulation will bring us to the point of this kind of cashlessness within, say, a generation as Mr. Cryan and I expect? The answer is probably yes, but that doesn’t mean we can’t take action to make sure! That M0 rump cash (and I exclude various categories of post-functional cash from this definition) should be actively managed out of existence. Europe needs politicians to take this seriously and put forward concrete and reasonable plans to achieve effective cashlessness. In order to help them in this endeavour, I am gathering input from a group of colleagues to assemble a “Manifesto for Cashlessness” to put forward with my good friend Geronimo Emili from Cashlessway at Money2020 Europe in Copenhagen. 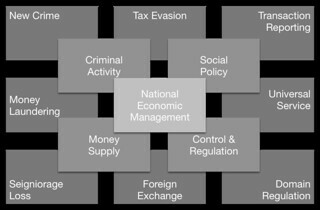 Way back at the 1997 World Economic Forum in Davos there was a discussion about the electronic cash that attempted to cover all of the relevant topics and I’ve used it a few times because it provides a useful starting point for discussions. I’ve updated that list of issues and brought them together in a structure that I think rather helpfully identifies four key areas that I’m going to use to structure the manifesto (any more than four key points and no-one will remember them!) over the next couple of weeks. So… if you have any comments on any of these issues please don’t be show and post them as comments on this post. I am genuinely interested to see what you think.